Great Stops’ Wash-N-Go 24-hour laundromats feature state-of-the-art Maytag washers and dryers. We have washers ranging in size from twenty pounds for small loads all the way up to eighty pounds for those larger loads. We have two sizes of dryers as well, thirty-five pounds and forty-five pounds. Our washers and dryers can handle any household laundry need. All of our equipment is set up to accept coins, debit cards, credit cards, and our very own reloadable wash card. We have an attendant (on duty 7-days a week) who can help you use the machines as well as any wash-dry-fold services you may need. Most wash-dry-fold services are same day pick up. 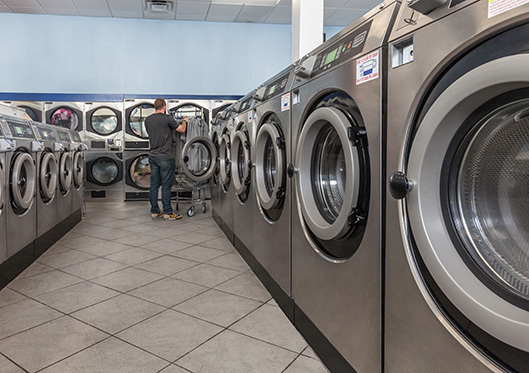 We offer a clean, safe, well-lit environment with flat screen TVs and free wi-fi, so you can feel comfortable washing your clothes at any hour of the day or night!